I found the 1920s Gimbel Hair Net in an online auction over seven years ago and paid $8.99 for it. The delicate floral design in the upper corners is typical of the period, and the depiction of women playing sports reflects the mania for physical activity that characterized the era. Over the past few decades, female athletes have embraced fashion as more than just an opportunity to endorse sportswear for a paycheck. In 1976 Olympic skater Dorothy Hamill won a gold medal for her performance on the ice, but it was her cute bobbed hairstyle dubbed the “wedge” that stole the show and started a fad. In recent years tennis phenoms Venus and Serena Williams have pushed the fashion envelope on the court many times. Serena’s black lycra catsuit caused a sensation at the 2002 US Open; and Venus ignited a media firestorm when she appeared at the French Open in 2010 in a red-and-black outfit that appeared to be part corset and part French maid’s costume. 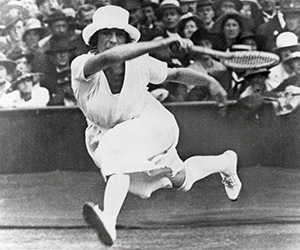 The Williams sisters have received both kudos and condemnations for their choices in tennis wear—but they weren’t the first to shake up the world of women’s sports fashion; that distinction belongs to Suzanne Lenglen. Suzanne Rachel Flore Lenglen was born on May 24, 1899, about 43 miles north of Paris. She was a sickly child, so her father suggested that she try tennis as a way to build her strength. Almost immediately she demonstrated a talent for the sport and her father began to train her in earnest. In 1914, Lenglen won the World Hard Court Championship at Saint-Cloud; however, WWI put an end to most national and international tennis competitions for the duration, and Lenglen had to wait several years to compete on the world stage. 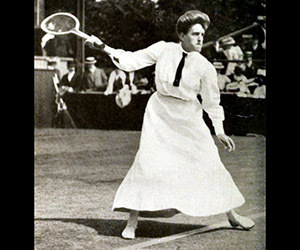 Her turn finally came in 1920 when she faced Dorothea Douglass Chambers at Wimbledon. A seven-time Wimbledon winner, Chambers was a formidable opponent, to say the least. Chambers took the court in the standard women’s tennis costume of the day: a voluminous skirt, long-sleeved blouse, starched collar, and a tie. Dressed like that it was a miracle she didn’t fall and break her neck. Lenglen arrived courtside in full makeup, wearing a dress that fell only to mid-calf (revealing the tops of her stockings when she moved just so) and carrying a flask filled with brandy that she sipped intermittently throughout the game. Unencumbered by multiple yards of fabric—and fueled by brandy—Lenglen won the match. Her daring costume (designed by legendary courtier Jean Patou) revolutionized the way women dressed for tennis, and she was just as stylish off the court with her bobbed hair and designer wardrobe. The Gimbel hair net package serves as a reminder to me that never does a woman look more stylish than when she’s pursuing her dreams.